Kodak Scan Station 120EX, a network scanner is now available with Laserfiche IntuitionMD software. This “plug ‘n play” solution will help healthcare organizations improve productivity by allowing anyone in a medical office scan and manage all electronic records in a single repository. David Hunt, an entrepreneur who owns H & H Services, a multifaceted enterprise with headquarters in Jackson, Ten., is featured as a person who worked two jobs to get to where he is today. His company grossed $6.5 million last year. Doc Imaging, H & H’s document imaging branch which sells Laserfiche now has a second office in Memphis. Hunt says that he sees a lot of opportunity out there for new technology. Jennifer Shipp, accounting manager of Gulf Coast Occupational Medicine in Baton Rouge, Louisiana, shares with DM Review Magazine how Laserfiche helped eliminate a number of inefficient work processes. The organization uses Laserfiche to organize all documentation including patient charts, personnel files, invoices, contracts, lab results, and insurance forms. Laserfiche experts demonstrated Laserfiche’s transparent records management capabilities while Collin County, Texas Records Manager, Margaret Anderson presented how the county uses the Laserfiche Records Management Edition and the backbone for the county’s case management system and to provide quality public service in a cost-effective manner. Eastman Kodak Company and Laserfiche announced that the Kodak Scan Station 120EX network scanner is now available with Laserfiche IntuitionMD software. The “plug ‘n play” solution will help healthcare organizations scan and manage medical bills and all electronic records in a single repository. Physician and medical offices can now immediately transition to electronic records and establish security to ensure HIPAA compliance using the Kodak Scan Station 120EX with Laserfiche IntuitionMD, which is available through Ingram Micro, a Kodak value-added distributor. Reporter Kaustuv Basu reports that the Gellert murder mystery in Brevard, Florida will be the first “cold case” from the sheriff’s office uploaded to Laserfiche’s online document management system. Thousands of pages of witness interviews, suspect information and notes are being scanned into Laserfiche’s electronic database. Lt. Bruce Barnett, who leads the homicide unit, hopes the ease of looking at the documents electronically might cast some fresh light on the incident, and maybe lead them to the man who walked away from the murder scene on March 20, 1994. Barnett said new technology is the best ally of unsolved cases. Electronically archiving the Gellert documents is another step in that direction, especially because of the volume of paperwork involved. Most murder investigations that Barnett deals with have a box or two of information. The Gellert case has eight. Eventually, the entire sheriff’s office’s 47 unsolved homicides and seven missing persons cases will be accessible online via Laserfiche to homicide agents. The system is a boon when dealing with complicated investigations involving a lot of paperwork, officials say. It was used by detectives in Wichita, Kan., to piece together clues and find the killer in the “BTK (Bind, Torture and Kill)” case, in which 10 people were murdered by the same person between 1974 and 1991, reports show. Law enforcement agencies nationwide use the system to give them easy access to documents, compare notes and witness interviews, and view photographs. Forrester found that imaging suppliers like Laserfiche provide packaged and easy-to-install business-process-focused solutions. Laserfiche has grown revenues and profit consistently and can be credited with defining the SMB market for ECM. It takes a “less is more” philosophy and focuses on helping organizations affordably eliminate the need for file cabinets. The reports says that Laserfiche takes care of the little things that help drive ECM adoption. Laserfiche 8 features further enhance support for specific business processes and include intelligent character recognition, expand scripting capabilities in the capture front end, and improve its workflow activities to allow pushing and pulling data to and from vertical-specific systems used in industry processes such as AP invoice management and account opening. Anita Carlton, MMC and City Clerk from Galesburg, Illinois was given the Visionary Award from Laserfiche representatives during the 2008 Municipal Clerks of Illinois Institute and Academy. The award was presented in recognition of Carlton’s service to the Municipal Clerks organization, her municipality and her innovative use of Laserfiche technology to improve the delivery of services to the public. Laserfiche reseller Nancy Mathes says that we have all heard that dog is man’s best friend, so it is no surprise that “Dog Goes Bad” will make the newspaper headlines because it is so unexpected. However, when the dust settles, we always find that the dog didn’t “go bad” but rather was “treated badly.” Seldom is a bad dog born; most often, a bad dog is made. So what does this have to do with technology? Mathes says that our world is now built on the solid ground of technology. But if something goes wrong, technology isn’t at fault, but rather it was used incorrectly—or it wasn’t used at all. She said that a digital document management solution with a records management component can play a key part in overall e-discovery planning because it protects and preserve both electronic and physical documents. She emphasized that training for the new puppy can lead to a great long-term relationship. She said that with the proper preparation, you’ll have an e-discovery program that will help you manage all your information, whether it’s paper or electronically stored, in a more compliant manner. But you need to start your records management program today, because if you delay, “Technology Bites Man” might just have your name in the headline. There is a global mandate for business and industry to adopt environmental friendly practices, but many financial advisers don’t understand how going green can benefit their practices. Technology can help advisers improve their processes, reduce energy consumption, enhance operational efficiencies and reduce carbon footprints. Authors Tim Welch and Louise Barnes said that simply by implementing technology to help with work flow processes, advisers are seeing a 9% reduction in overhead as a percentage of revenue. They also experience increases in the value of the business of hundreds of thousands of dollars to millions of dollars, depending on the size of the firm, according to a recent white paper from Laserfiche of Long Beach, Calif.
Laserfiche today welcomed Davis Business Machines as the latest authorized Value-Added Reseller (VAR) delivering strategic business performance solutions to clients in the Lehigh Valley and southeaster Pennsylvania. In this article, the author explains the benefits of enterprise content management for human resources departments. Adams explains that with modular capture, distribution, process management and integration tools, digital enterprise content management solutions can help HR departments of all sizes manage information, increase information security and accelerate the disposition of legal cases. Laserfiche today announced the release of its comprehensive enterprise content management white paper. The ECM Paradox: Extending Local Flexibility to Strengthen Central Control demonstrates how enterprises across industries can effectively and simultaneously provide local autonomy over business process improvement and central oversight over policies and direction. Eastern Kodak Co. and Laserfiche announced that the Kodak Scan Station 120EX, a network scanner is available with Laserfiche IntuitionMD software. “When Laserfiche announced its healthcare solution, we looked forward to working together in this exciting application for the healthcare market. This is an incredibly important channel in terms of growth and for accurate data management, as the very quality of life is at the center of it,” said Dolores Kruchten, general manager of document imaging and vice president of Eastman Kodak. Geneos, a Laserfiche “Run Smarter Award” winner, has announced a new version of its award-winning Geneos Nexus Platform which provides accessibility, flexibility and a myriad of business efficiencies for advisors and broker/dealers. Nexus 2.0 automates many of the tasks associated with an independent financial advisor’s business, including account opening, compliance, and reporting. A fully open architecture platform, Nexus 2.0 enables its users to manage data in multiple formats and applications and allows comprehensive paperless document imaging. Enterprise Content Management (ECM) technology buyers are under pressure to cut costs and justify expenses at a time when small and mid-market vendors are now providing less expensive alternatives to larger ECM vendors. Reporter Manoj Jasra said that a CMS report found that vendors like Laserfiche represent a lower risk in terms of both product and corporate stability. Laserfiche said that together with its Middle East partners, it will exhibit at GITEX Technology Week to be held in Dubai October 19-23. The conference attracts more than 130,000 visitors from more than 60 countries. Laserfiche said that together with its Middle East Partners it will exhibit at GITEX Technology Week, October 19-23, 2008. Rio enterprise content management will be one of the key products featured at the show. 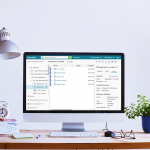 During GITEX week, Dubai-based distributor Pixel Systems introduced Bit Faster’s contact management and email marketing system, which allows companies to customize and direct mass email. Meanwhile, Pixel is working with key partner, Laserfiche, to assist both Dubai Municipality and Abu Dhabi customs authorities with placing their historical paper archive resources onto a more modern and easy-to-access software management system. “We have deployed a complete solution of Laserfiche applications and a team of operators to scan the documents into electronic format,” explains Manoj Ganapathy, Pixels’s sales manager for the Middle East region. Laserfiche, a U.S. electronic document management software development company and Quadralink, the exclusive distributor of Laserfiche products to Vietnam, today announced the official signing of a memorandum of understanding with the Vietnamese National Institute of Software and Digital Content Industry (NISCI) to provide electronic document management software services and solutions. Laserfiche customer Alejandro Catalan, representative for the state of Guerrero said that they have integrated a document management solution with GIS for the city of Acapulco. He said the plan is to digitize information and aerial photos of more than 550,000 property using Laserfiche. Sandra Vila, Laserfiche regional manager for Latin America spoke about Laserfiche Rio and how once an organization determines the number of users it can be deployed quickly across the enterprise.